Discussion in 'VPN' started by Odkrys, Apr 19, 2018. WireGuard still work in progress, therefore, using it at your own risk. You need Entware-aarch64-3.10 to use wireguard without a new firmware build. 2. as Client configuration setting. Init file has 5 options. LocalIP is provided by VPN provider (e.g. AzireVPN, Mullvad) or your VPS. default route will redirect your all internet traffic to VPN server. policy work like Policy Rules (strict) on Merlin. wgdns is option to change dns server. Nipset is the name of ipset for ipset based policy routing. AzireVPN, Mullvad, IVPN, TorGuard support WireGuard servers. AzireVPN's config file looks like above one. Fill the Address 10.40.12.49 at LocalIP of init file. And comment out Address and DNS in the config file. For using Route=policy, wg-policy script has some rules. 4. as Server configuration setting. Generator script will generate QRcode image for Android or iOS. You need to install qrencode first. you have to add wg interface to Dnsmasq listening interface list. This script will ask you 3 options. WireGuard use iptables so when the firewall is restarted, the rules will gone. Please add this in nat-start script. logger -s -t "($(basename $0))" $$ "**Warning Wireguard is UP.... restarting Wireguard"
Scripts are not beautiful. They just work. Sorry, this is my best. They have some rules to prevent duplicate. The error messages (e.g. iptables) are not real error. WireGuard author does not assure Tunsafe security. I just used it for benchmark purpose. Zonkd, umarmung, kamoj and 1 other person like this. Sounds interesting. Will try to take a look at it and test it during the weekend. Will comeback with a followup. Will be nice to compare with my recent VPN speed test done, using OpenVPN. Finally managed to set it up and did a speed test. 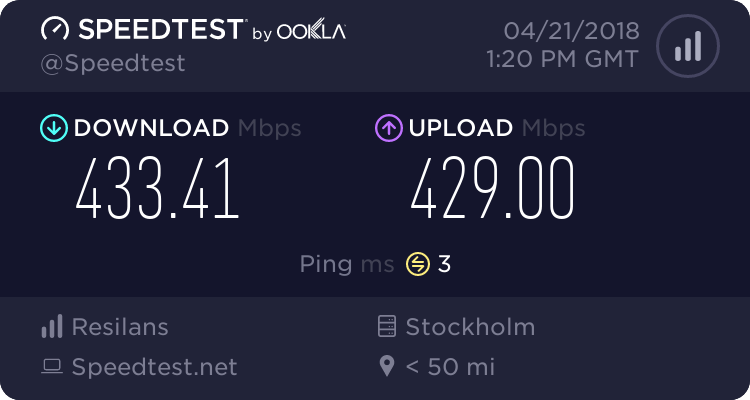 You are right ... 400+ Mbps is possible. At the same time, the CPU use is about 100% on both CPU's. Wrote a short blog article about this test on my page. I think you might be conflating his CPU utilization with CPU load (each core cannot exceed 100% utilization). Indeed, in his screen shot the CPU load is 5.34. There is no wireguard server or cheap vps in my country. So I could not test max speed of it. I think you might be conflating his CPU usage with CPU load (each core cannot exceed 100% use). Indeed, in his screen shot the CPU load is 5.34. Well this high CPU usage was only while I have done the Speedtest with Speedtest.net. Under normal usage, the CPU is around 1-2 %. Did a couple of Speed tests in a row, before I took the screen shot. So it's not only one speed test I did once I got WireGuard running. Can you explain more in detail how to use this config if I want to use policy based routing. Everything works fine when I use the default and all my LAN devices are going out using the WireGuard connection. All devices have fixed IP addresses locked by MAC address. Please write an example how to wg-policy config should look like if I for example want to route LAN device 192.168.1.10 + 192.168.1.20 through the WireGuard connection. change Route to policy and add this to end of wg-policy script. This may enough for you. Don't touch ##For ipset based Policy Routing part. This two rules should be added to wg-down script too. For best performance, make sure you run it on the second CPU core, so it won't share the same core as the rest of the routing/NATing code. For OpenVPN that provides a very significant performance boost. @RMerlin, would it be possible to implement WireGuard inte Merlin firmware? As Odkrys said, it's multicore aware. Uses both cores while testing. No extra configuration is necessary. I have people asking me to implement Shadowsocks, Wireguard, L2TP, PPTP, XOR-patched OpenVPN... It just never ends, everyone wants his personal favorite tunneling solution implemented. This is beyond the scope of my project, not gonna devote countless hours maintaining all of these different solutions. OpenVPN suits pretty much everyone's needs, it's highly flexible, and just supporting that one already takes a large chunk of development time. Not gonna duplicate this 3-4 times by also supporting a bunch of other technologies. Beside, implementing Wireguard makes even less sense than the other solutions, since out of 8 different routers, only one single model would be able to support it. Only RT-AC86U is able to run wireguard on Merlin firmware. The tls-crypt support added in 2.4 takes care of that. no more kernel error messages. it will work smoothly from now on. Does anyone have a slightly more "starting from first principles", "step-by-step" guide to getting this working?